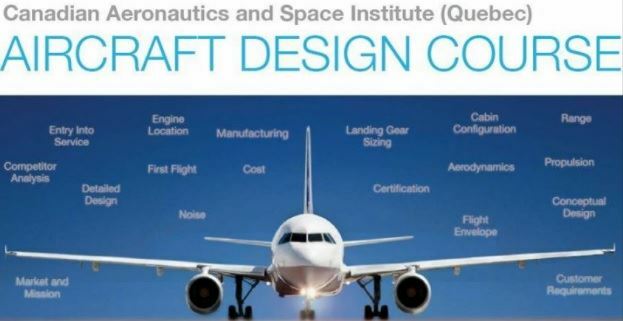 The CASI Quebec Aircraft Design Course gives an overview of practical working knowledge of principles, practices and techniques used for industrial conceptual design. An aircraft is a particular combination of wing, fuselage, empennage and power plant. Conceptual design focuses on the best way to integrate these components to best fulfill the design requirements. The initial aircraft layout depends upon factors related to the mission role, the economic efficiency, the operational and functional requirements, the safety and reliability of the vehicle, the type of propulsion system, and so on. The course will be focusing on how the conceptual designer can maximize the synergy in the global system and the multi-disciplinary nature of aircraft design. Breakfast, lunch and beverages will be served! Full poster here. May count towards professional development hours!